Panzerkampwagen V...the best tank of WW2? I do love playing it in "World of Tanks" online. Panzer V was a panzer fielded by Germany in World War II that served from mid-1943 to the end of the European war in 1945. It was planned as a counter to the Red Army T-34, and to replace the Panzerkampfwagen III and IV, though it served along with them as well as the heavier Panzerkampfwagen VI until the end of the war. The Panther’s very excellent combination of firepower, mobility, and protection served as a benchmark for other nations’ late war and immediate post-war tank designs and it is often regarded as one of the greatest tank designs of WW2. Until 1944, it was designated as the Panzer V Panther and had the ordnance inventory designation of Sd.Kfz. 171. On 27, February 1944, Hitler ordered that the Roman numeral V be deleted from the designation. The Panther was a direct response to the Russian T-34 and KV-1 tanks. First encountered on 23 June, 1941, the T-34 outclassed the existing Panzer III and IV. At the insistence of General Heinz Guderian, a special Panzerkommision was dispatched to the Eastern Front to assess the Red Army tanks. Among the features of the Soviet tank considered most significant were the sloping armor, which gave much increased shot deflection and also increased the effective armor thickness against penetration, the wide track, which improved mobility over soft soil, and the 76.2 mm gun, which had good armor penetration and fired an effective high-explosive round. Daimler-Benz (DB) and Maschinenfabrik Augsburg-Nürnberg AG (MAN) were given the task of designing a new thirty to thirty-five-ton tank, designated VK30.02, by April 1942 . The creation was a direct homage to the Red Army T-34. It resembled the T-34 hull and turret form. DB’s design used a leaf spring suspension whereas the T-34 originally used coil springs. The DB turret was smaller than that of the MAN design and had a smaller turret ring which was the result of the narrower hull required by the leaf spring suspension. The main advantages of the leaf springs over a torsion bar suspension were a lower hull silhouette and a simpler shock dampening design. Like the T34, the DB design had a rear drive sprocket. Unlike the Soviet T-34, the DB design had a three-man turret crew: commander, gunner, and loader. But as the planned L/70 75mm gun was much longer and heavier than the T-34’s, mounting it in the Daimler-Benz turret was difficult. Plans to reduce the turret crew to two men to stem this problem were eventually dropped. The MAN design had more conventional German ideals with the transmission and drive sprocket in the front and a turret placed centrally in reference to the hull. It had a petrol based engine and eight torsion-bar suspension axles on each side. Due to the torsion bar suspension, the MAN Panzer V was higher and had a wider hull than the DB model. The slightly earlier, Henschel designed PzKpfw VI heavy tank’s use of a “slack track” Christie style pattern of large road wheels without return rollers for the upper run of track, and with the main road wheels being overlapping and interleaved in layout, were plan concepts broadly copied with the MAN model for the Panzer V. The two designs were reviewed over a period from January 1942 to March 1942. Reichminister Todt, and later, his replacement Albert Speer, both recommended the DB design to Hitler because of its several advantages over the initial MAN PzKpfw V plan. However, at the final submission, MAN improved their PzKpfw V plan, having learned from the DB proposal, and a review by a special commission appointed by Hitler in May 1942 ended up selecting the MAN design. He then approved this decision after reviewing it overnight. One of the principal reasons given for this decision was that the MAN plan used an existing turret designed by Rheinmetall-Borsig while the DB design would have required a brand new turret to be designed and produced, substantially delaying the commencement of production. The MAN Panzer design also had better ability to handle water hazards, easier gun maintenance and higher mobility due to better suspension, wider tracks, and a larger fuel tank. A mild steel prototype PzKpfw was producedby September 1942 and, after testing at , was accepted. It was put into immediate production. The start of manufacturing was delayed, however, mainly because there were too few specialized machine tools needed for the machining of the hull. Finished Panzer tanks were produced in December and suffered from reliability issues as a result of this manufacturing haste. The demand for this tank was so high that the production was soon expanded beyond MAN to include Daimler-Benz, Maschinenfabrik Niedersachsen-Hannover (MNH) and Henschel and Sohn in Kassel. The initial panzer tank manufacturing target was 250 per month at MAN. This was increased to 600 per month in January 1943. Despite determined efforts, this figure was never reached due to disruption by Allied bombing, production bottlenecks, and other difficulties. Panzer V tank production in 1943 averaged 148 per month. In 1944, it averaged 315 a month (3,777 having been built that year), peaking with 380 in July and ending around the end of March 1945, with at least 6,000 produced in total. On July 30th of 1944 in close proximity to Les Loges in Normandy, three Jagdpanthers from schwere Panzer Jaeger Abteilung 654 ambushed a squadron of British 6th Guards Tank Brigade eliminating some 10-11 Churchill tanks in a short interval of two minutes. At the same time, other squadron of British 6th Guards Tank Brigade opened fire at three Jagdpanthers causing crews of two of them to abandon their vehicles (as a result of damaged tracks), while the third one retreated.Jagdpanthers were grouped into independent schwere Panzerjager Abteilungens - heavy anti-tank battalions (with 3 companies with 14 vehicles each and 3 vehicles in battalion HQ) and those that operated as part of Panzer Division. The first Jagdpanthers were issued to schwere Panzerjager Abteilung 559 and 654 and reached the frontline in Western Europe in June of 1944. Only 654th had full compliment of 42 vehicles, while 559th had only 10 to 14 vehicles. Majority of Jagdpanthers developed saw service on the Eastern Front, while only single battalion (schwere Panzerjaeger Abteilung 654) saw service during Normandy Battles in the Summer of 1944. In preparations for the Ardennes Offensive, the largest number ever of Jagdpanthers was assembled, including vehicles transferred to the Western Front from the Eastern Front to take part in the offensive. Roughly 51 Jagdpanthers in six battalions took part in the conflict in December of 1944. Small number of Jagdpanthers was used by Waffen-SS formations and only 2nd SS Panzer Division Das Reich, 9th SS Panzer Division Hohenstaufen and 10th SS Panzer Division Frundsberg (part of the 6th Panzer Army) received company each during relief attempt to liberate encircled garrison of Budapest in January of 1945. Out of original 42 issued to those divisions only 12 were working on April 1st and eventually took part in the defense of Vienna. 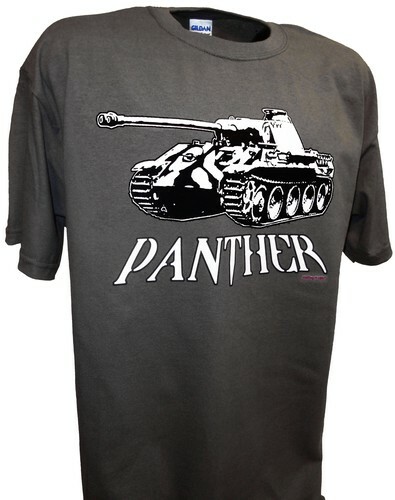 From 1945, Jagdpanthers were also issue to Panzer Abteilungs of 7 Panzer Divisions, The Fuehrer Grenadier Regiment and single Panzer Brigade, but using them as substitute tanks was a mistake but a necessity at the time. In 1944/45, Krupp was doing work on fitting Jagdpanther with rigidly fixed 88mm Pak 43/1 L/71 gun mounted in rear mounted superstructure. Along with this project, there were plans by Krupp dating back to November 17th of 1944 to install 128mm Pak 80 L/55 gun in a Jagdpanther II but the end of the war ended both projects. It has been said that a single unit equipped with Jagdpanthers also received and used infrared night-vision devices - Infrarot-Scheinwerfer, just as those mounted on Panthers. Today, early model Jagdpanther can be seen at the Imperial War Museum in England and late model Jagdpanther at Aberdeen Proving Grounds (which I have seen personally) in USA and Thun, Switzerland. Jagdpanthers can be seen in museums in Munster and Sinsheim, Germany. Vehicle at Aberdeen Proving Grounds was produced by MNH in November-December of 1944 and took part in the Ardennes Offensive, where it was captured and eventually taken to USA. The excellent firepower of the 88mm gun, excellent mobility and low to the ground silhouette made Jagdpanther a remarkable opponent when used in the correct manner. It had a combination of defense, firepower and mobility made it a superb tank destroyer. The Jagdpanther was perhaps the finest tank destroyer manufactured during the Second World War. If the Jagd would have been unveiled sooner, it may have had a larger impact in World War 2.